I’ve been on an organizing frenzy lately, which I cannot blame on pregnancy hormones this time around. Storage and organization can be challenging when living in a 700 square-foot home. My usual remedy to an organizing kick is to clean out our three closets and kitchen cabinets, but less things have been turning up in the donate pile – I blame all those thrift store finds – so I’m relying on shelves instead. 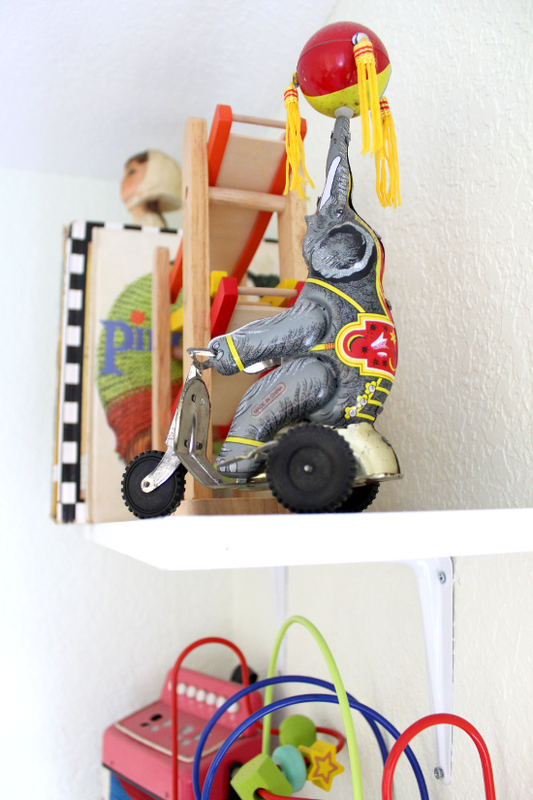 Specifically, shelves in our son and oldest daughter’s bedroom. Previously, there were four shelves in this room (which you may have spotted here or here), so it wasn’t very challenging to add two more since I already knew where any wall studs (read: nemesis) were. I used the cheapest white brackets I could find and leftover shelves from when I was a teenager. Some of the shelves are yellowing so I may slowly replace them with new ones, found here. 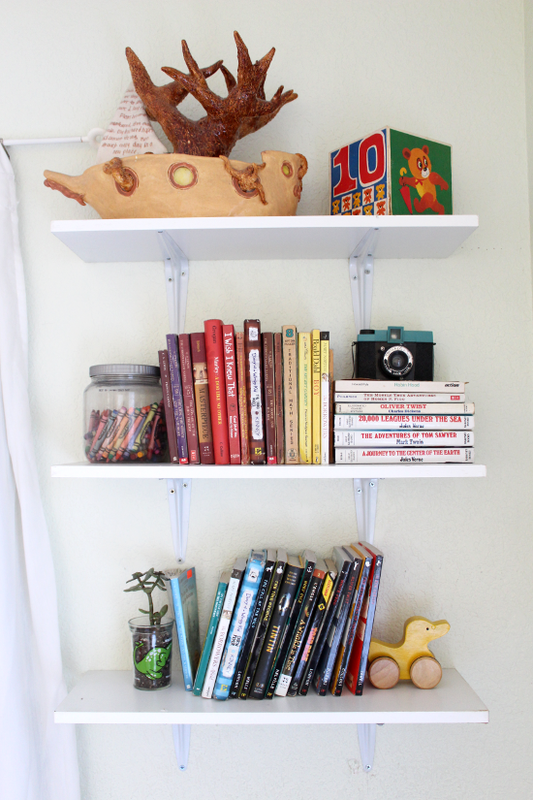 Yellowed or not, they add such great storage for my son’s growing book collection – am I rubbing off on him? – and my daughters growing toy collection, which can also be partially blamed on me. Even though I’m pretty pathetic at styling shelves, I have so much fun taking the time to do so. I even went as far as color coding my son’s books – I’m hooked! The red accordion and tin elephant were both souvenirs from a trip I took to San Francisco in high school; evidence that my toy collecting started before I was a mother. The record player is actually a brand new gift from Christmas. 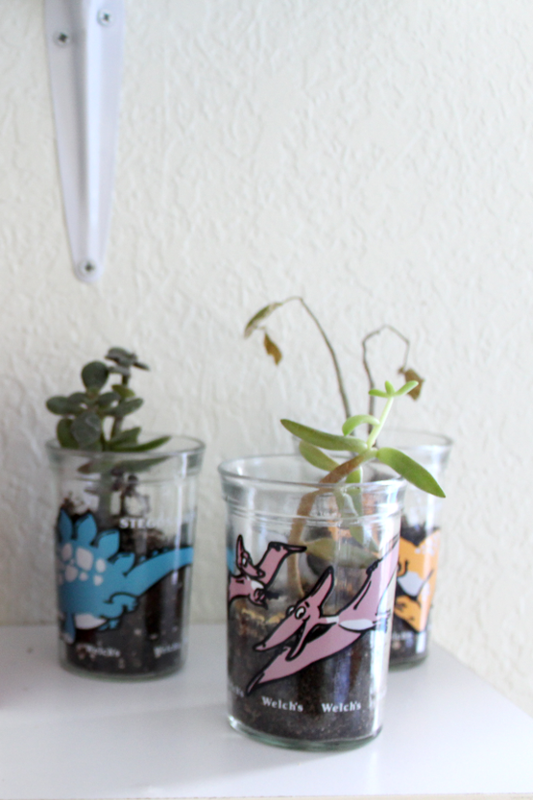 The succulents I planted in those dinosaur jelly jars are surprisingly still alive, even though I did replace two of them a couple of months ago and one looks pretty pathetic. 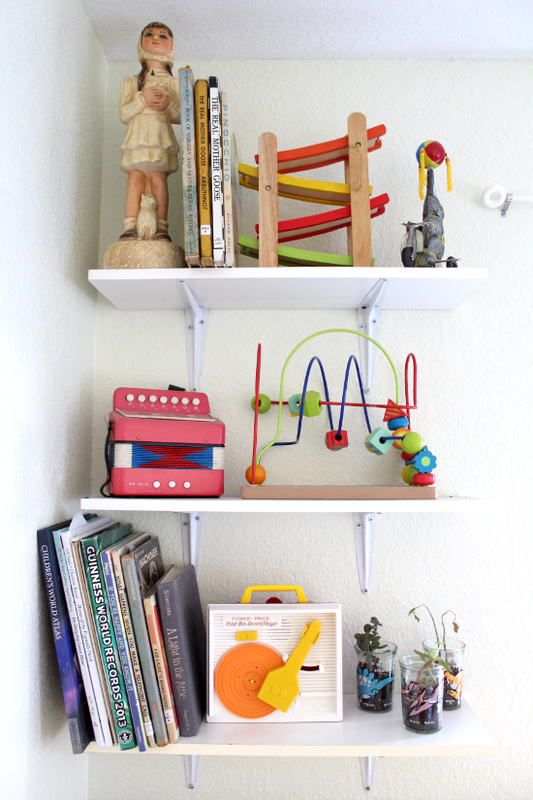 So far the shelves have given me my organization fix but I already have my eyes set on another target – our old bedroom, which will soon be the girls shared bedroom. Until then, these two new shelves will do. 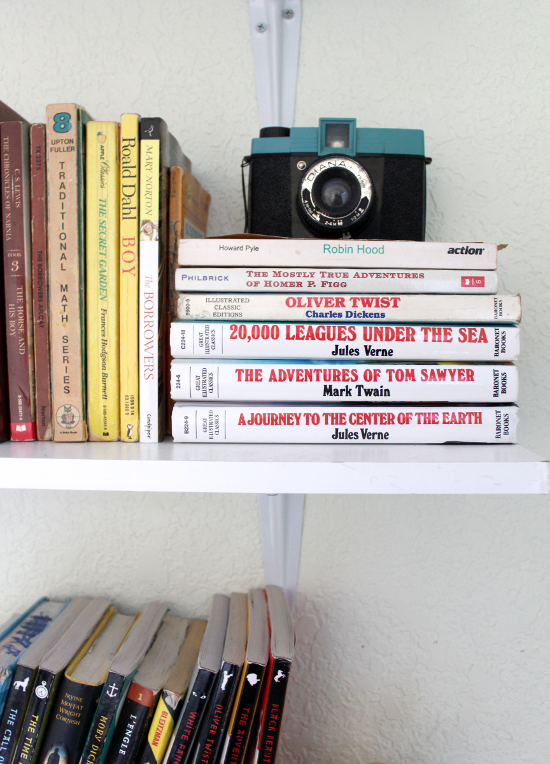 How do you tame the urge to organization? I just downsized into a 750 square foot apartment. These shelves look great! I'm definitely going to have to copy you! Thank you, Brittany! There is definitely something special about living small.